Duncan Campbell never dreamed when he headed off with his friends for a day of swimming at the lake that his life would change forever. Duncan was born and raised in Winnipeg, Manitoba. He loved sports, especially hockey, and was a rink rat until the age of 15 when he chose to quit organized sports. He became involved with a different group of friends who were more interested in hanging out than participating in sports. One day when Duncan was 17 years old, he and his buddies headed to the local swimming hole. They decided it would be fun to do skim dives from a tree stump into the water, which was about 1m deep. On Duncan’s sixth dive, he hit the bottom of the lake head first. He lay underwater for a minute or so, unable to move, until one of his friends who was a lifeguard realized that something was wrong and dove in to pull him out. Duncan was rushed to the hospital, where he was told he had broken his neck at C7 and was a quadriplegic. The year was 1973. Duncan spent four weeks in acute care at the hospital and then was transferred to the Manitoba Rehabilitation Centre, where he would re-learn the life skills necessary to become independent again. Being a quadriplegic and having no feeling from the bottom of his arms and down, he found that many of the basic skills he used to do easily now needed to be done in different ways. At the rehabilitation centre he was taught things such as how to wheel his wheelchair, transfer in and out of his chair, dress himself, exercise his hands and arms to make them as strong as possible, and exercise his whole body for overall health and strength. After nine months, Duncan was released from rehab. His parents’ home had been modified to accommodate his wheelchair and Duncan was happy to be at home with family and friends. While Duncan was at the rehabilitation centre, a wheelchair athlete came to talk to him about wheelchair sport opportunities available to him. He wasn’t very interested at first but then became involved with wheelchair sports in 1975 with some other quadriplegics. Duncan started training at the rehabilitation centre for wheelchair racing and field events. Among other things, the training involved working with weighted pulleys. Because of the limitations in their arms, they needed a volunteer to help them with the pulleys during the workout. One night, the volunteer couldn’t make it, so Duncan and his friends headed to the gym for some exercise. They began wheeling around the gym, throwing a volleyball back and forth trying to score by throwing the ball into a garbage can. Because of the limited mobility in their arms, however, nobody could get the ball out of the can, so they decided that wheeling over the end line between two pylons would work better as a means of scoring. This new game, which was originally called Murderball, was created that night. Duncan and his friends continued to play this new game, encouraging some of their able-bodied friends to join them. They were convinced that this great new game needed to be promoted beyond Manitoba, so Duncan went to the multi- sport/multi-disability games in Edmonton in 1975 and convinced a number of other provinces to form teams for a Murderball demonstration. In 1976, the first demonstration event was held in Newfoundland at the Canadian Games for the Physically Disabled. It was a huge success and the beginning of the National Wheelchair Rugby Championships. Now, thousands of athletes around the world play this great sport. There are teams already formed in 24 countries and 8 more countries are starting teams. Athletes can be of any age, though they are most commonly between 18 and 40 years old. One interesting fact about wheelchair rugby is that, unlike most wheelchair sports, men and women play together. This is because only 20% of quadriplegics are female, so it would be difficult to find enough athletes to make up a full team. Although the game was originally called Murderball, the name was changed to Wheelchair Rugby in 1981 for a broader acceptance and funding purposes. Wheelchair Rugby is known as a Heritage Sport because it was a game that was created in Canada. In the United States, the game is called Quad Rugby. Wheelchair rugby is an intense, physical team sport for male and female athletes who have a physical disability that affects both their upper and lower body. It has its roots in wheelchair basketball, hockey, handball and rugby. In order to play wheelchair rugby, an individual must have some form of permanent mobility related impairment in at least three limbs. Wheelchair rugby is played indoors on a hardwood basketball court by teams of four players and up to eight substitutes. The players are classified according to their functional ability and are assigned a point value from 0.5 to 3.5 points. The four players on the court cannot exceed 8.0 points. The object of the game is to move a ball down the length of the court and score a goal by carrying it across the opposing team’s goal line. Goals are located at each end of the court, span eight metres in length, and are designated by two cones. When an offensive player has possession of the ball and any two wheels cross the goal line, a goal is scored and 1 point is awarded to the team. At the end of regulation time, the team with the most points wins. The ball may be passed, thrown, batted, rolled, dribbled or carried. The ball must be bounced at least once every ten seconds. Each game consists of four, eight-minute quarters. Setting a pick occurs when one athlete holds another athlete with the wheelchair in order to prevent him/her from becoming a part of the play. This is both acceptable and encouraged. What’s unique about wheelchair rugby? Wheelchair rugby is played on a hardwood court. Wheelchair rugby encourages wheelchair contact. Canada boasts one of the top teams in the world and BC has one of the top teams in Canada. For more about the Game and Rules see Lesson 6. 1979 First Canadian National Championships. 1979 First appearance outside Canada at a demonstration event in the United States of America (USA). 1981 First team was formed in the USA. 1982 First international tournament, teams from the USA and Canada only. 1980s Other local and national tournaments occurred in various countries. 1989 First international tournament, in Toronto, with teams from Canada, USA, Great Britain, and Australia — a breakthrough for developing international competition and cooperation. 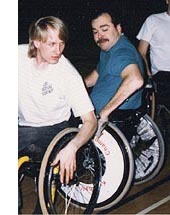 1990 First appearance at the World Wheelchair Games as an exhibition event. 1993 Officially recognized as an international sport for athletes with a disability and the International Wheelchair Rugby Federation (IWRF) was established as a sport section of the International Stoke Mandeville Wheelchair Sports Federation (ISMWSF). Fifteen countries participating. 1993 Included in the 1993 Stoke Mandeville World Wheelchair Games in England. 1994 Officially recognized by the International Paralympic Committee as a Paralympic sport. 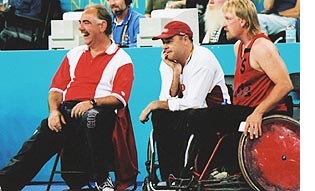 1995 First Wheelchair Rugby World Championships in Switzerland. Eight teams competing. 1996 Included as a demonstration sport in the Atlanta Paralympic Games. 1997 Duncan Campbell selected as Team Manager for the Canadian National Team. 1998 World Championships in Toronto. 2000 First inclusion in Paralympic Games competition program as a full medal sport in Sydney Summer Paralympic Games. 2004 Canada Cup International Wheelchair Rugby Tournament created in BC. Wheelchair Rugby is now played in 26 countries with 17 more under development.